NBC’s procedurals may have taken too long a spring break. FOX: After pausing in its fairly steady decline for a 0.1 lift last week, EMPIRE dropped 0.2 to 3.6, still by far the highest-rated show of the night. The evening started with ROSEWOOD down 0.1 to 1.2. CBS: SURVIVOR was steady at 2.1, then CRIMINAL MINDS returned from a week off with its season finale at 1.8, up 0.1 from 2 weeks ago. CRIMINAL MINDS: BEYOND BORDERS held at 1.2, despite this week’s much stronger lead-in. ABC: THE MIDDLE stayed at 1.7, but THE GOLDBERGS took a 0.3 leap to 1.9. MODERN FAMILY came back from 2 weeks of reruns at 2.2, steady with its last new episode, and BLACK-ISH was up 0.1 from last week to 1.6. NASHVILLE was up 0.1 to 0.9. NBC: HEARTBEAT lost 0.1 to 0.7. 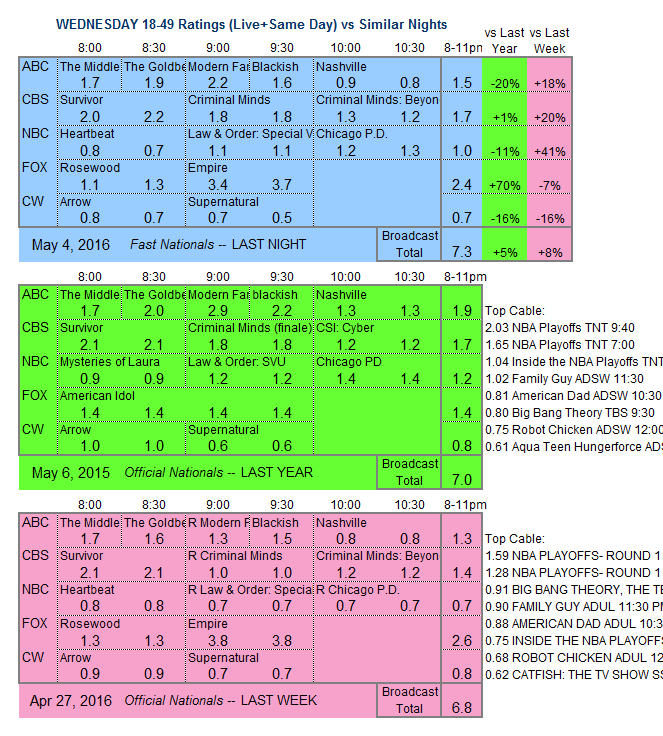 SVU and CHICAGO PD had taken the last month off, and came back down 0.3 to series lows for both, respectively at 1.1 and 1.2. 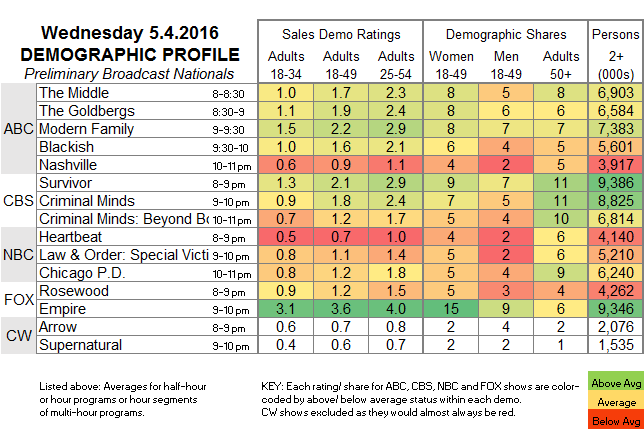 CW: ARROW fell 0.2 to 0.7, and SUPERNATURAL was down 0.1 to 0.6. It’s another sweeps-fueled all-new night tonight on the broadcast networks.